Key Labour and Co-operative figures have launched a collection of essays exploring a co-operative alternative for London’s problems. 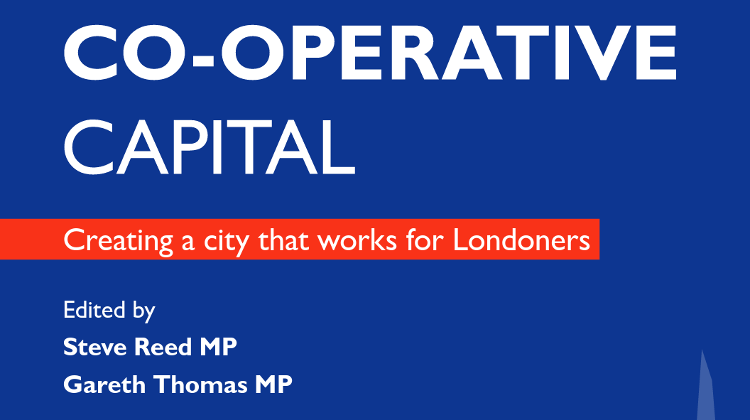 It is hoped the book, “Co-operative Capital: creating a city that works for Londoners”, will shape the policy debate in London ahead of the 2016 mayoral election. The 15 essays propose co-operative solutions to issues such as the lack of affordable housing, unemployment, payday loans, inefficient public services and the need for affordable and sustainable energy and transport in the capital. The collection is edited by two of London’s Labour/Co-op MPs, Steve Reed and Gareth Thomas. In her essay, the Co-operative Party’s general secretary Karin Christiansen examines how promoting social enterprises and co-ops as part of a strong social economy could help create jobs and wealth for the benefit of all London’s economy. For this to happen, London needs a new generation of businesses, she says. Ms Christiansen also challenges the assumption that co-operatives struggle to innovate or keep pace with the decision making of shareholder models. Another burden for parents in London is the cost of childcare, often keeping them out of work. Labour MP Tessa Jowell thinks that supporting co-operative childcare nurseries could help address the issues of cost, flexibility and quality of childcare in London. Nursery co-ops could give parents a discount of fees or lower their cost by encouraging parents to volunteer at a nursery and take up different tasks. “Embracing co-operative childcare could lead to better care for lower cost, more flexible hours and smaller facili­ties which are located in mixed communities – just what families in London need,” writes Dame Tessa. Co-ops could also play a role in tackling London’s housing crisis, says David Lammy, MP for Tottenham. He suggests building more housing and increasing the share that is co-operative so as to keep rents affordable. This could also help give tenants a bigger say over housing services. As shareholders of a housing co-operative, members have the right to vote on decisions which affect their tenancy. The Labour MP thinks publicly owned urban regeneration sites and other public sector land should be given to community land trusts to ensure they are retained in perpetuity to benefit the community. More housing associations should consider adopting a co-operative approach, he adds, by putting tenants and leaseholders right at the heart of housing management. Another contributor, Labour/Co-op MP Seema Malhotra, suggests creating co-operative business clusters to help local economies grow and become more sustainable. By working together, businesses would share information, which would help them manage risk better. She calls for a co-ordinated policy across central and local government, and local agencies such as enterprise partnerships. While the cost of energy is increasing faster than income, a community project in Brixton helps support local energy projects across the borough of Lambeth. In his essay, Cllr Lib Peck, leader of Lambeth Council, describes how Repowering London, a community-based organisation, has established three solar energy projects using the roofs of council buildings through the creation of renewable energy co-operatives. As well as generating income from feed-in tariffs and the sale of electricity to the grid, these co-ops allocate 20% of annual revenue to a community energy efficiency fund, which helps fund initiatives such as home energy audits and draught proofing to address fuel poverty. Val Shawcross, London Assembly member, suggests co-operatively run bus operators offering pay guarantees for staff as well as running a new co-operative patient and door-to-door disability transport service. The essays also look at ways to improve improve schools in London. Cllr Wes Streeting believes this could be done by empowering parents. In his essay, he explains how, in co-operative schools, everyone has a stake in the school’s success: parents, teachers, support staff, governors, pupils and the wider community. Parents should have a greater say in who runs their schools, he argues. Already, 700 co-operative trust schools have been established across the UK, all collaborating through the Schools Co-operative Society. This helps enhance the quality of learning and teaching, he argues. As well as giving parents a greater say over their children’s education, the pamphlet suggests using co-operatives to empower patients and improve healthcare. A member of Ed Miliband’s taskforce for mental health in society, Cllr Patrick Vernon suggests making third sector, social enterprises, co-operatives and mutuals preferred providers in commissioning healthcare. “We need a co-operative healthcare agenda for London to give patients a bigger say over the care they receive, reduce health inequalities, and move towards services that prevent health conditions becoming health crises,” he writes. The book also highlights the role credit unions can play in providing access to affordable loans. Cllr Richard Watts, leader of Islington Council, says this would help people to save, provideinformation and tools to manage their money, and offer affordable sources of credit. The council provided a £250,000 grant to the London Credit Union last year and worked to help them increase membership. It has also trained financially experienced residents to act as “debt champions” by offering free advice and support on managing household budgets to people in their own community who are struggling.